Among the notable contributors to ‘The Dynamism of the Palestinian Economy’ was the Palestinian Business Council. Established in 2004 with its main objective to strengthen economic and cultural relations between the UAE and the expatriate Palestinian community, the council has been proactive in bridging the gap between the two and in overcoming the typecast challenges that were a roadblock in the past. 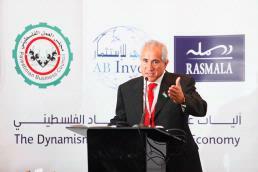 The event was sponsored by AB Invest, Palestine.